Talk to any runner about energy and he/she will happily launch into conversation. Mention ‘chi’ rather than ‘energy’ and odds are a small percentage will nod knowingly, a slightly larger percentage might smile and pretend to be open to ‘whatever works for you, dearest’, some will respond with a derisive snort and others will roll their eyes and turn away. Of course it is a matter of each one to his own, but as a slow ultrarunner – and therefore someone who is out on a course for considerable hours – an opportunity to learn rudimentary techniques affording me forward motion with maximum efficiency and minimal effort could not be missed. 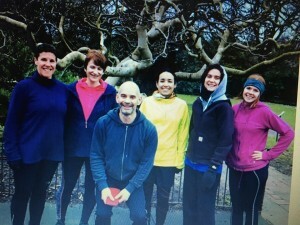 It was with some excitement, then, that I found myself stepping through the door of Gray Caws’ Chi Running Workshop for beginners (http://www.n8pt.com/). I would not be disappointed. The small group (5 in total) was friendly and meant that everyone got ample individual attention and it was easy for everyone’s questions to be answered. Following brief introductions and without further ado, the first order of the day was to film us all running. After that it was back to the classroom but there was no time for sitting down. In fact, there was very little sitting down. A couple of my friends had speculated that we would spend an hour at least listening to the origins and philosophies of all things ‘chi’. Not so (although, having a teenage background in martial arts I am great believer in the power of chi so I wouldn’t have minded this at all!). The morning was spent learning about correct postural alignment, why it was so important as a runner/walker and what we should be aiming for and how to adjust and correct. In the most basic terms, the better your postural alignment the less work the body has to do to enable forward motion. In other words, the less effort would be needed. We spent a lot of fascinating time learning exercises to correct and ‘discover’ the most ‘functional’ posture – in terms that made such complete and ‘grounded’ (no pun intended) sense. Having got the general gist of these basics, it was then time to analyse our individual running form (video-ed earlier). Armed with the knowledge of what we were aiming for, these analyses were hugely informative and enlightening. Even after just that couple of hours, we were all able to view movements such as ‘my arms keep crossing my body’ or ‘my feet fly out to the sides’ not merely objectively but with a very comforting and motivating awareness that we now knew ‘why’ we did it, where the movement originated from and how we could begin to correct it. The afternoon afforded us time to put some of this into practice with drills focussing on maintaining alignment while moving, the effect of cadence and the importance of arm movement. If ever there was a worthwhile workshop for runners – or walkers (! ), this was/is it! Sceptics can stay away. All others should put aside any preconceptions of ‘fluffy’ ideas or images of groups of runners chasing various auras around the park whilst chanting various incantations (don’t tell me some of you haven’t pictured this!). Nothing could be further from the truth. For a runner – and I think (probably mistakenly but definitely subjectively) endurance runners – the word ‘chi’ should be readily available in your vocabulary. It has certainly jumped to the top of mine. Check out upcoming workshops or find out more at Gray Caws or http://www.chirunning.co.uk/.